Arrival in Vilnius, transfer to Hotel Radisson Blu Astorija***** or similar, check-in, welcome meeting. Heading for Riga, the first stop is the Hills of Crosses, one of the most holy sites of Catholic Lithuania. After crossing into Latvia we soon reach the magnificent Rundale Palace, the former summer residence of the Duke of Courland. 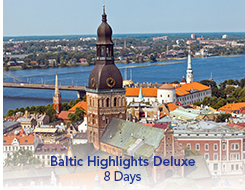 Following a guided tour of the palace we travel through the rolling hills of Southern Latvia to reach Riga late afternoon, check-in at Hotel Radisson Blu Ridzene***** or similar. Riga, founded in 1201 by the German bishop Albert, is the largest of the three Baltic capitals and boasts a real kaleidoscope of architectural styles. The walking tour of the Old Town includes Riga Castle, the Dome Cathedral, St. Peter's Church, the Swedish Gate, the Three Brothers, the Large and Small Guilds and the Freedom Monument. The afternoon is reserved for an optional visit to Jurmala, the vibrant Latvian sea resort, famous for its wooden architecture and sandy beaches. In the evening enjoy an optional Latvian dinner at the stylish Restaurant La Boheme. The tour continues along the coastal highway to the Estonian summer resort of Parnu. We do a short tour of the resort before we continue through the North Estonian land of forests and arrive in Tallinn early afternoon, check-in at the Hotel Radisson Blu Sky***** or similar.